For a decadent dinner party dessert that’s guaranteed to please, try our white chocolate, orange and Grand Marnier crème brûlées. Put the bowl over a saucepan of gently steaming but not simmering water and add the white chocolate, orange zest, Grand Marnier and thyme. Slowly warm through, letting the chocolate melt gently. Once it has melted and slightly thickened, strain the mixture into a jug and divide equally among 6 ramekins. Arrange the ramekins in a large roasting tin and carefully pour boiling water from a kettle into the tin until it reaches halfway up the sides of the ramekins. Cook in the oven for 18-20 minutes until the custard has set but still wobbles when nudged. Leave to cool, then chill in the fridge for 1 hour (or up to 24 hours) until ready to serve. 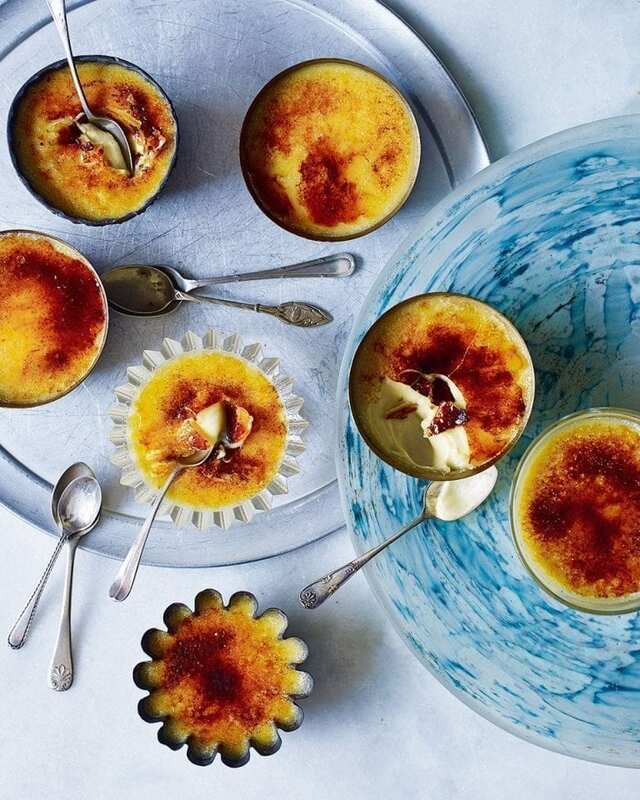 Just before serving, sprinkle the remaining sugar evenly over the custards and caramelise using a cook’s blowtorch. If you don’t have one, you can put them under a hot grill for a few minutes, but in either case, remove the heat source when the sugar is a little lighter than you want it, as it keeps caramelising for around 30 seconds afterwards. Leave the caramel to set and harden for a few minutes before serving. Scorch the custards once set to stop them curdling. Free the egg whites for up to 3 months in a freezer bag, marked with the number of whites and the date. Cook the crèmes brûlées up to 24 hours in advance. Leave to cool, cover with cling film and chill in the fridge. Just before serving, top with sugar and scorch.